My flight from Amman was nearly an hour late, making the journey of perhaps 200 miles take more than 6 hours. but driving is not an option,as crossing the border into Israel can take hours itself. Waiting for the flight, I began chatting with a youngish man from Boston and Delhi who travels nearly nonstop for his company. He produces programs for the airline industry that a supposed to enhance the customer,s experience. Like automatic upgrades for certain airlines, he mentioned SAS,one of my favorites. He had been on the go for nearly six weeks, usually only a day or two per country, from Mexico to Moscow in one case! We eventually boarded,and I found myself across the aisle from an interesting looking older man wearing an orange linen shirt over a tee shirt with shirts and flop flops. He had very expressive eyes, and I had noticed him in the departure lounge. I removed my iiPad from my carryon, Intending to read “A Passage to India” which I had just purchased,from iTunes, while waiting for my flight in the Amman airport. Something about my travels had reawakened my interest in this classic novel of colonial life in India, perhaps the recognition of the power wielded by the Europeans in shaping the current configuration of the middle east, and the consequent political turmoil. Then,the man with the interesting eyes noticed my device and asked a question about what it does. I explained a bit and handed it to him. Our conversation proceeded and I found out that he is an Israeli film director who lives in southern India.he was very tired having flown from Chenai to Calcutta to Amman, and now on to Tel Aviv. He said that he comes to Israel for 2-3months when he comes, to visit those of his children who still live here. I asked him if I might have seen any of his films, and he mentioned one whose title translated to ” Hot Wind”,I will look for it when I get home. We landed, I followed the signs to “Immigration”, and ended up choosing the absolute slowest line! I stood there inching along slowly, for nearly an hour. Once back at my same small hotel near the beach, I walked my way back to the same cafe where I had enjoyed the scene a couple of weeks ago. Tel Aviv may not have the historic charm of Aleppo, but it has a glorious waterfront promenade full of people even on a Monday afternoon. I enjoyed a chicken salad, not especially good, and a beer while reading and eavesdropping, more or less, on various conversations in a variety of languages. Right now, there are four Frenchmen playing cards at the next table. Children are running all over, with some dogs, and adults in varying dress fro skimpy bathing suits to track suits strolling the sand at the edge of the sea. Not a bad ending to my middle east exploration. My flight to Frankfurt leaves at 5 am tomorrow,which requires me to be leaving the hotel at 1:45 am, not much of a night.I figure I’ll go for dinner around 8, come back to lie down for a while, shower,re- dress, and I’m off! Leaving Petra for a full day of desert, our bus climbed out of the Wadi Musa ( Valley of Moses) area where Petra lies, with spectacular views of mountains beyond mountains with cloud shadows falling irregularly on the peaks and valleys. If I’d been driving I would have stopped for a photo, but alas, I couldn’t stop the whole bus! I tried a couple of shots out the window, but they were futile attempts to capture a very unique sight. I’ll just have to keep it in my head. 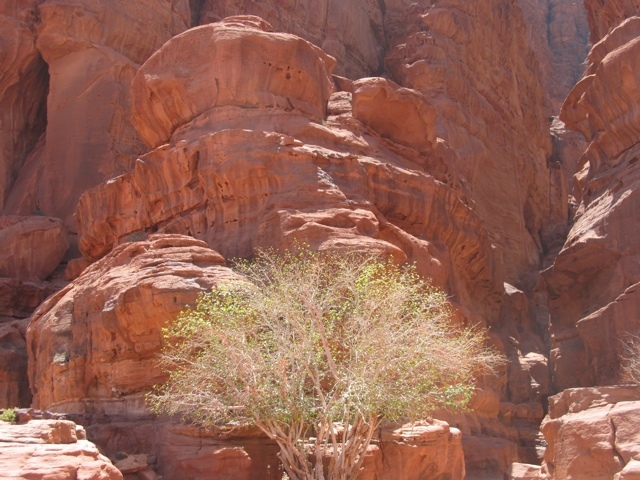 We drove up and out and south to Wadi Rum, a protected region of desert with iconic wind and water carved rocks. The whole area was once under the sea, and as you drive along, the feeling of being on the ocean floor is very strong. Our travel in the Wadi was in small trucks fitted out with benches in the flat beds, and light canvas covers to keep out the sun. At first we took 4 trucks, comfortably spread out, but soon, one of the trucks had mechanical trouble and the 5 folks in it had to be ferried to where the other trucks were waiting for the group. These are all small, elderly Toyota or Nissan vehicles, some originally just pick-ups, at least one was a Land-Cruiser in its former life. As I remembered from Libya, old cars are better than newer ones in the desert. They break down, but are easily fixed by amateurs. One of the three working trucks stopped suddenly, and we all thought, “Oh no, this could get awkward”. Turned out it was out of gas. We watched as the drivers got a piece of plastic tubing and an old plastic water bottle and began to siphon gas from one tank for the other. The driver did remember, at the last minute, to toss his cigarette away prior to starting the siphon. Several members of the group gave sighs of relief. The truck I was in had 6 of us in back and Alice, our tour manager, in the cab with the driver. It became a comedy of sorts to watch as the driver had to pound his door from the inside to get it to open, each time we stopped. While Alice had to keep hold of the door on her side to prevent it from swinging open as we drove along very bumpy dirt/sand/stone “roads”. We stopped to examine petroglyphs, marks made on stone by people who lived in the area long ago. Exactly how long ago is up for debate. 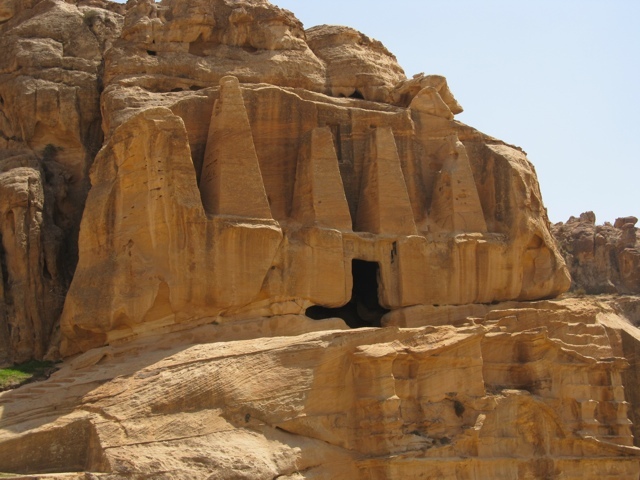 There were also inscriptions carved or painted onto some rocks in language that may be Nabataean or some version of ancient Semetic languages. 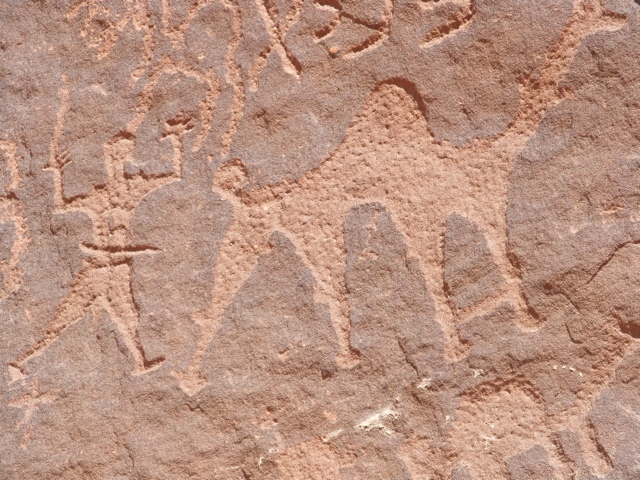 My favorite petroglyph has a man and a clearly 4 legged camel. There is something about the camel especially, that tickles me! It is so determinedly depicted, with each leg clearly shown, as a child might draw a family dog. It’s not just any camel, but someone’s camel. For me, the interest was in the shapes and contrasts of sand and stone. I love the way the stone has been shaped by water first, then wind. 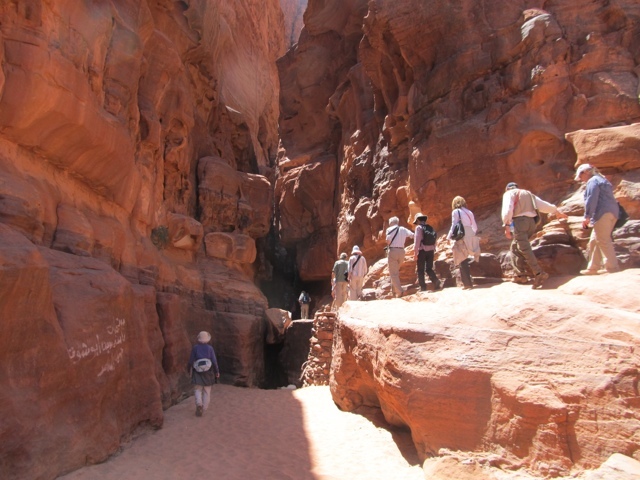 There are deep narrow chasms which were once reliable water sources, when the area had more rain and a higher water table. Now, the water lies 400-600 ft below the surface. Still, there are fig trees flourishing and other flowering bushes and plants were in blossom. 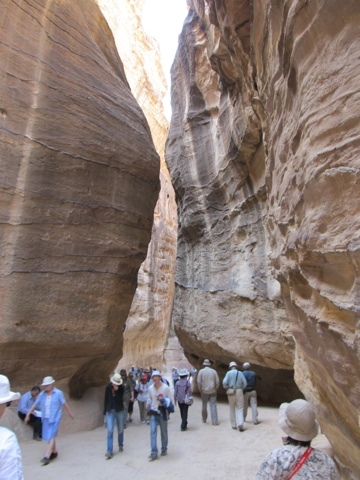 Of course, it rained in Petra yesterday, quite hard, and perhaps in Wadi Rum, too. Just a little water makes a huge difference in the desert. The four trucks full of tourists raced back to the village where our bus was waiting to take us to lunch. I noticed a camel parking lot, with relaxed looking camels, fitted out for riding, but taking their break along with the drivers. 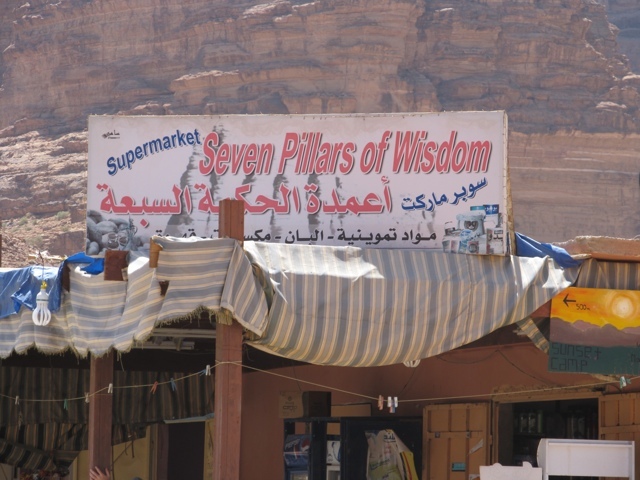 And two small stores across the road from each other with the names ” D.H. Lawrence Store” and “7 Pillars of Wisdom Store”. The film “Lawrence of Arabia” with Peter O’Toole, was filmed largely in Wadi Rum, back in 1963. 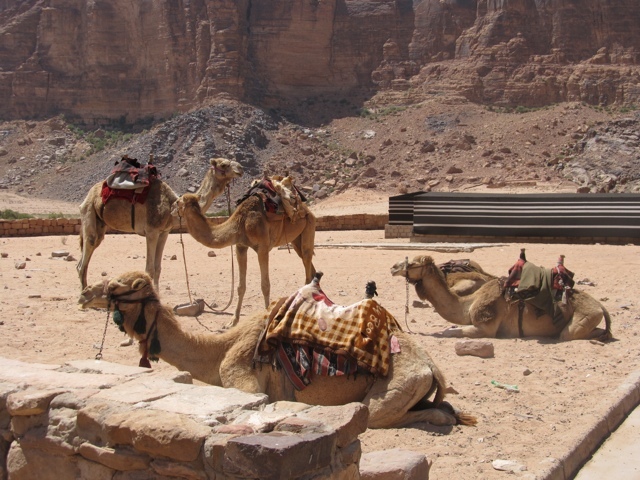 We drove about 8 miles to an interesting tourist alternative to a hotel – the Wadi Rum Camp. It consists of rows of tents, some large, some small, toilets and showers ( very clean and with hot water) and a large dining area under tent-like roofs. 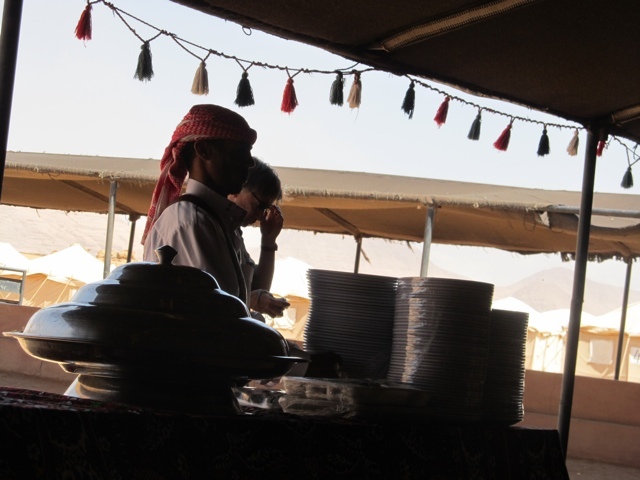 We were served a special Bedouin dish called ” Zede” – lamb chunks, potatoes and carrots cooked in a wire basked in a covered metal can sunk in the ground with hot coals placed over the top. It stays in the ground for about 4 hours. 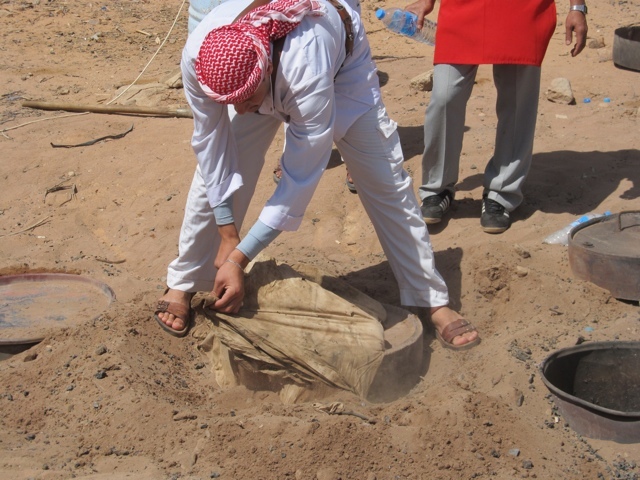 The presentation was quite dramatic as we followed 3 men to the location of the buried can and watched as they shoveled the hot coals off and removed the lid and eventually the food. We returned to our tables and soon two men arrived bearing an enormous covered metal dish with the lamb, etc over a really delicious rice. We got in line and were served large portions. There was plain yogurt to eat along with it. Really delicious! They served a kind of coconut cake which had a sugar syrup poured over it, and warm! Awfully sweet, but good and I ate it all, as did most everyone. Back to the bus for the ride back to Petra. Tonight is our “wrap-up lecture” and “Gala Dinner”. Lots of apostrophes, but that’s how it all seems to me. A bit of forced gaiety. Still, I’ve enjoyed this trip immensely. Tomorrow is a short morning tour of some local sites, that I might skip in favor of a leisurely breakfast and repacking project. I’ve acquired just enough stuff to make an extra bad necessary. I have some with me, but I need to strategize the best way to change my packing to account for checking a bag. I leave Monday for Tel Aviv ( briefly, at most 12 hours) then Frankfurt/ Heidelberg for 2 days, then home on Thursday the 14th. As usual, it’s gone by so fast. This trip, with such a strong and specific focus on archaeology left me realizing that my interests are much more varied. 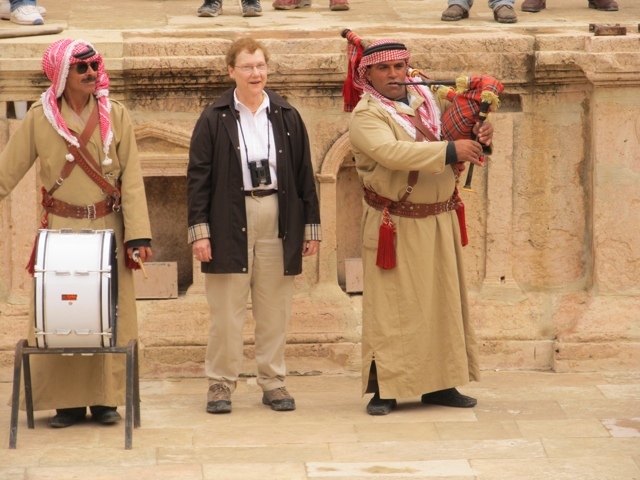 There wasn’t much, if any, time to experience the culture of the current Syria and Jordan. The souks, well, we walked awful fast through some, but always on the way to somewhere “more important”. For me, it’s all important. My next trip may have to be more balanced between some identified focus and time to explore – unscheduled time. Lots has been happening in the rest of the world, but in my traveling bubble, all’s been well. Hope your bubbles have been good to you too! Forgot to finish the story. On our bumpy ride up from the Treasury to the entrance ( ancient paving stones are not pleasant in a carriage with no springs), when we could talk, we asked our driver a few questions. Turns out, the whole in-site transportation concession is run by basically one big Bedouin family. “My uncle” owns it, is the standard answer, along with “my cousin”. I asked why the horses were all draped from their shoulders to past their tails. ” Because they poop” was the answer. When we dismounted, I looked more carefully and saw that the horse was wearing a sort of diaper ( I think the Central Park hansom cab horses do too) and that the whole messy thing was covered to protect tourists from the unpleasant facts of a horse’s life. The horses do a really hard job, but not as hard as the donkeys. Like everywhere they exist, a donkey’s life is a hard life. Here, they were carrying people, often large people, around the site along semi-paved paths and limestone block areas. In Morocco, they are often piled with straw, baskets of fruit, kindling, way taller than the animal itself. And yet, they trudge along. 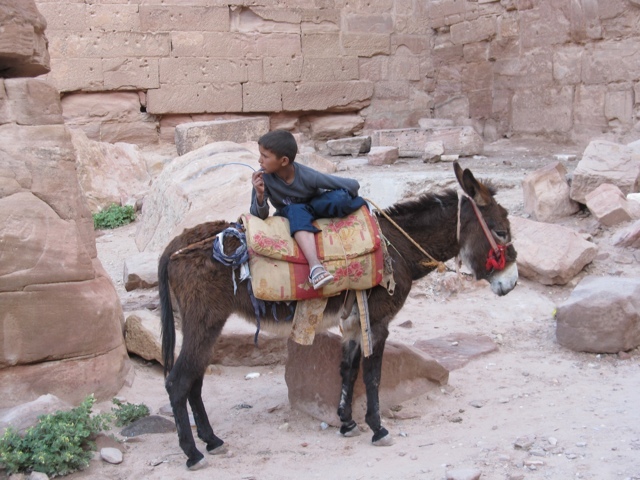 Someone should make a monument to the donkey, beast of burden for so much of the world. As we were walking back, at around 6:30, we saw one donkey, loose, running as fast as it’s little legs would carry it, with a kid on another donkey in pursuit. Earlier, as our group was leaving one area, a donkey kind of joined our bunch of tourists, seemingly trying to escape in the crowd. It didn’t succeed! I finally made it to Petra. We got on the bus at 8am, and arrived here in time for lunch at around noon. By 1:30 we were heading across the street to the site entrance. I had no idea of the scale of this place, having done little reading before hand. I read what the tour had given us, but that was mostly about the archaeology, not a general description of what a visit involves. 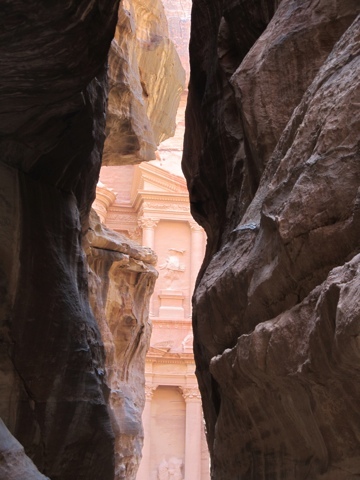 The most famous spot, the “Treasury” facade, lies about a mile in from the entrance, down a grade and then through the narrow passage between very high rocks that was formed by running water millions of years ago. 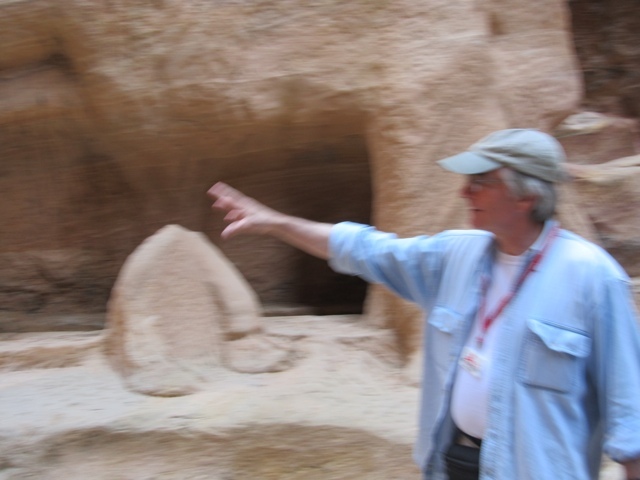 The Nabateans, the people who built the structures here, did so after re-directing the course of a stream to better serve the needs of the area. They built water pipes all along the rock corridor that brought water to temples and probably living areas. 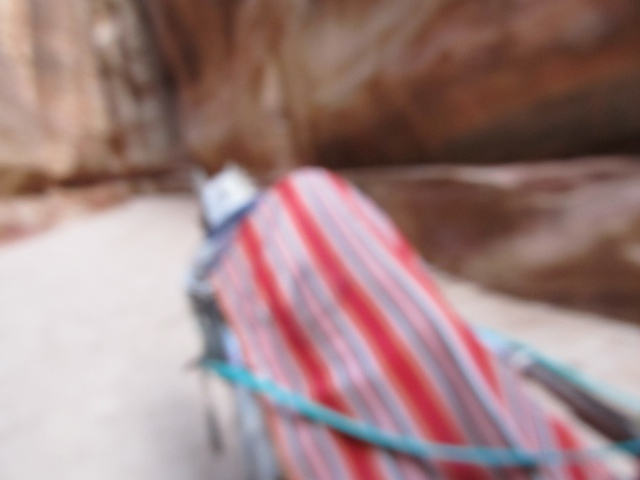 As we descended the dirt and pebble path into the “siq” as the narrow gap is known, horse-drawn small carriages were hauling people up and down along their own designated area. They all look alike, with red,yellow and green striped canvas tops and the same fabric draped over the horses backs ( more on that later). My friend MIchelle and I agreed that it looked like a good idea for the return trip uphill. Little did we know how much we would look forward to that treat! This trip is a real test of physical stamina. Many of the participants are at least 15 years older than I, and some older than that. There is one couple who, while in their early 70’s I’d guess, have more energy than I have ever had! They are indomitable travelers, on the go for many weeks at a time, lugging large, heavy cameras wherever they go. I get tired much more easily, and need moments of “alone time” now and then to recover my sense of self. Others just seem to forge on, I don’t know how they do it. 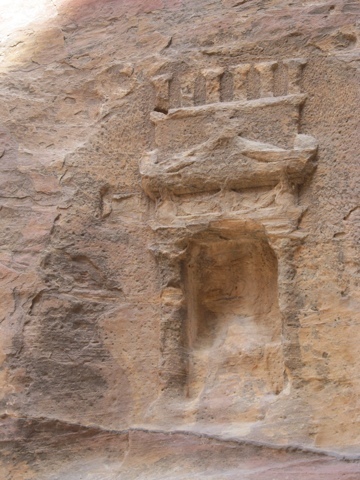 The path into the site starts to get interesting when carved niches in the striated sandstone walls of the george start to appear. The stone has so many colors – reflecting the length of time it was under the pressure of an ocean, according to one participant whose knowledge I am confident is accurate. Then, through a very narrow spot, one sees the first glimpse of the building known as “The Treasury”. 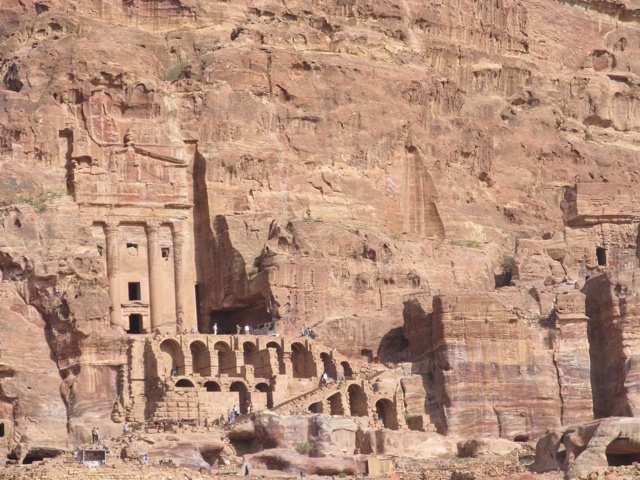 The rocks close to you are darker, the building carved out of a kind of sandstone that seems to glow pink in the sun. I’ve seen the photos before, I was prepared for it, but still it was breathtaking. The guys who did the carving were really really good at what they did. Apparently starting from the top of a section of stone, they shaped pediments, circular statue niches, tall columns, windows, doors – all perfectly level across, to my eye. And the structure has recently been revealed to be at least another 50 feet tall. The lower levels were buried in rubble as the control of the water flow was abandoned along with the rest of the site in the 6th century AD ( I think, could be wrong about the date). The water tore up the carefully laid stone paving blocks and other rubble and deposited it right in front of the most gorgeous structure, it was at the point where the water has to turn and slow, and the rubble dropped out of the flow. We learned about that and more, and then continued on, and on and on. I probably would have been pretty much satisfied if I’d not realized that there was more. The main, and most beautiful structure, is really wonderful and worth studying and enjoying. 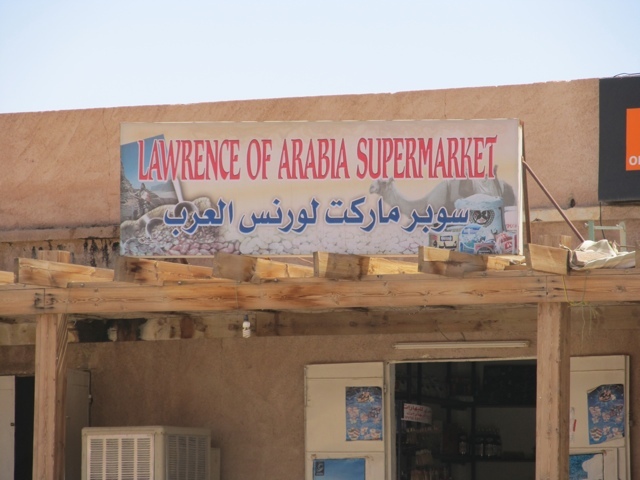 And there’s a gift shop selling cold drinks,boys on camels and horse carriages all offering rides to tourists – what more can the cultural pilgrim need? But, as it turns out, there are more carved areas, though none as deep as the first nor of as beautiful stone. There are caves where people lived, churches from the Byzantine era with lovely mosaics and one with unusual blue granite columns that came from very far away. There is the remains of a roman paved road, with colonade, and a rather mysterious large flat raised area which has been called a “temple” but our archaeologist says is not that. And, next to the mystery platform ( which has unusual octagonal limestone block paving) was, perhaps, an irrigated pleasure garden. These folks did know how to control water, so it’s not impossible that they made a garden, with a shallow pool. It gets really hot here in the summer. Michelle and I started to head back when the official program of the day was over, about 4 hours after we started ( 5:45 pm by then). We’d been walking, climbing up high steps and over rocks, standing and listening for a really long time. Guys were trying to get us to rent camels for the ride back to the Treasury, but we had decided to walk that far, and hire a carriage for the last, most uphill part. It took some grit, as we were both wiped out, but a few stops to sit helped and we made it back to the hotel around 7pm. Showered and re-dressed, I made it to the dining room by 8pm. After dinner, I finally got on the internet after one bad card had to be replaced by another. My tummy was feeling not quite right, but not awful. I planned to head back to the Treasury this morning in time for the light to hit it and do some sketching. But, in the morning it was clear that something I ate did not agree with me. So, I stayed close to my room all day, venturing out once to a gift shop near the hotel for some mementos. Then a nap, some reading, some yogurt and a banana, a movie. A generally lazy day. 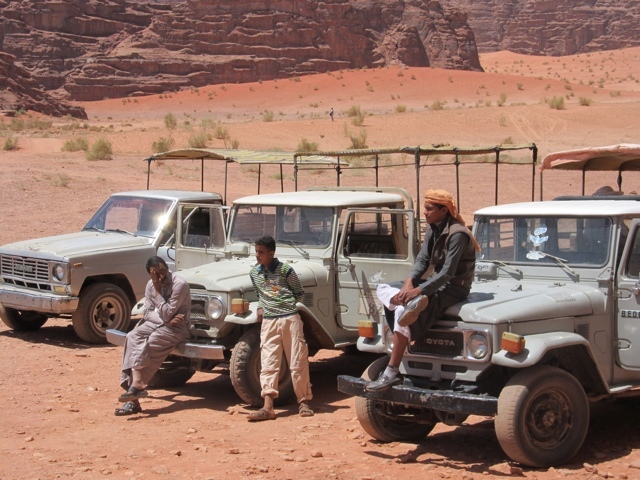 Tomorrow we are going to Wadi Rum, where we will ride in pick-up trucks to see what there is to see. More later. The tour I signed on to is great, really great. But once in a while, I need a day to myself. I had planned to have a day in Damascus, according to our original plan, but plans changed. So, since we had an extra day in Jordan, I decided to take myself out to find some contemporary art. I asked our lecturer about what he knew, and it turned out that he knew a lot. He has spend quite a bit of time in Amman and had some great suggestions.Samhir, our country guide, was also helpful and wrote out the name of where I was going first in arabic, so I could so the taxi driver. The best part of the day was sleeping till 8am! After day after day of 6 or 6:15 am wake-ups, the luxury of sleeping until I woke up, and not rushing out the door was totally wonderful! I was the last person to leave the breakfast room at the hotel, and that was fine with me. The first taxi took me to the National Gallery of Art, two buildings facing each other across a small park that has lots of sculptures in it. It’s in a charming neighborhood of older, 1920’s and 30’s homes that used to be the most desirable area of Amman. Now it is still nice, but not “trendy”.I walked in to the quiet museum, and found only one other visitor. The ground floor has mostly paintings on canvas and sculptures. The second floor has mostly works on paper, some sculpture, and some older paintings. Work by contemporary artists from all over the arab world is the focus of the collection. I noted artists from Jordan,Syria, Iraq,Lebanon,Palestine, and Egypt. Just on the first floor. I took photos of some pieces, which I will include with this posting. I found the work to be exciting, thoughtful and current. After exploring both buildings, I headed out to another location a sort of community for artists called “Darat al Funun”, or little houses of art, something like that. My taxi driver wasn’t sure where it was, despite my attempts to explain. We got close, but Amman is a very difficult place to navigate. It is built on quite a few steep hills and neighborhoods are focused on a particular hill. In between the neighborhoods are valleys which sometimes are open space, sometimes full of houses and businesses. Moving between areas requires a lot of back and forth. The neighborhood’s streets seem to go in circles as they wind around hill tops, and streets can be difficult to locate. The driver opened his window to ask a guy if he knew the place I wanted to go, he did, and climbed into the front passenger seat, and off we went. They let me off at the bottom of a series of stairways leading up 3 or 4 stories to the Darat al Funun back patio. I paid the driver and offered a tip to the “helper” but he refused. I said “Shukran” and headed up the steps. I found my way into two video installations, both rather humorous. The first was a video inspired by hard bread the artist was served in Egypt. The large rounds of typical arabic bread were so hard that all he could imagine doing with them,was tapping them musically. The video shows 4 musicians, dressed formally in black suits. sitting in a row, “playing” the breads and making music. They are taking the process very seriously, and one does, too, when watching the video. The other was about young boys training to be barbers. They have to practice shaving balloons, which explode when nicked! Poor boys! I went back outside to find out what else was in this place, when two youngish men came up the stairs and starting talking with an older man who had directed me to the videos. I asked if they were artists, and whether they had studios here. One said, yes, he was an artist, and his studio was nearby. I thought he meant in a part of the complex and was very happy to follow him. Instead, we walked back down the flights of stairs I’d only recently come up, crossed the street, went down more stairs, more stairs and into the terrace of a building. He unlocked the door and showed me some of his recent paintings. He is a poet and caligrapher and painter – and he incorporates all three elements in some of his work – the ones I liked best. His name was Muhammed, and his english was surprisingly bad for a guy his age, I thought. Still, he was really nice and after we looked at his work, he walked me over to another large private gallery very near by. In this lovely space, the new work of an Iraqi born artist was shown. I eventually ended up in a conversation with the owner, a woman, whose son had worked at the San Francisco Fairmont Hotel. She loves my hometown! After some chat, she gave me a book that she had published about a Palestinian naive artist who she represents. I left, heading for Jebel Amman, a neighborhood, and Rainbo Street. This turned out to be the locus of the young and hip, student types and young professionals in Amman. Coffee shops, bakeries, bookstores. I found a small restaurant and had a small chicken sandwich and tea and enjoyed people watching for nearly an hour. Then I headed towards another gallery a few blocks away, that was supposed to open at 4pm. I arrived at the door at 4:15, but there was no sign of anyone. Rather than wait, I chose to check out Books@Cafe, just down the street. The ground floor is a bookstore,with both English and Arabic books. Upstairs is a cafe featuring american food. And a free computer! ( with a really slow connection) I check my email,the news headlines, and then settled in for a cup of tea and a piece of carrot cake. The waiter was a young man, who only had worked there for about 3 weeks, but seemed to be making a difference. Turns out he had worked as a pastry chef in Texas, and the owner wants him to help figure out how to make better american style desserts. I told him that the carrot cake was dry and needed more spice. He agreed and was looking forward to working on it! 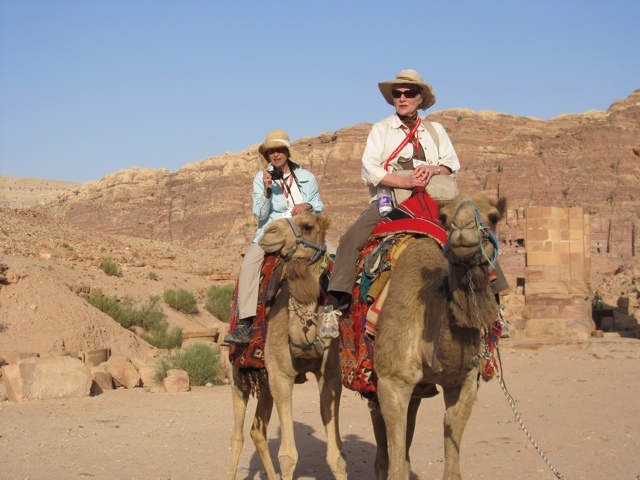 I found another taxi to take me to the Petra National Trust office to meet up with my tour group. 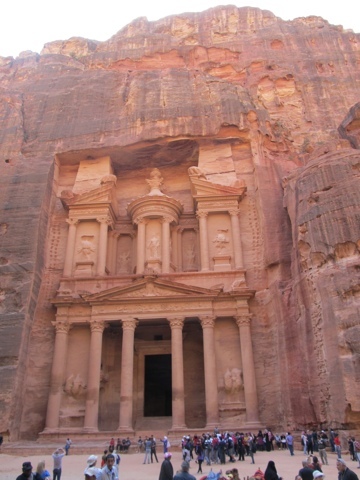 We learned a lot about how Petra is being preserved and explored, then headed back to the hotel for a quick change for dinner. I was fine, but the rest of the group had been out since 7:30 that morning, and were given 30 mins to change and be back on the bus for dinner at one of Amman’s nicest restaurants. Whew! I was go glad that I’d had my “day out”. 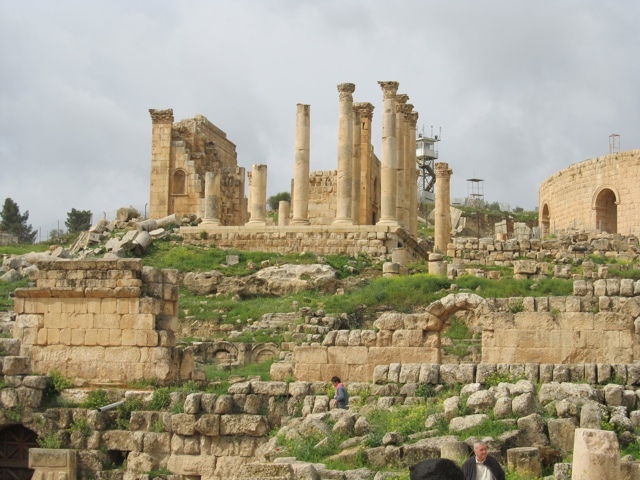 Photos of Jerash,the gorgeous city ruin near Amman, and of some objects in the conservation lab. Not a good night for sleeping, no apparent reason. I told myself that I could leave the tour at any time and go back for a nap. We got on the bus with our new local guide, Samirh, a tall balding man of about 40 with a good sense of humor and the habit of saying “inshallah”, God willing, at the end of statements about the future, and I like that! 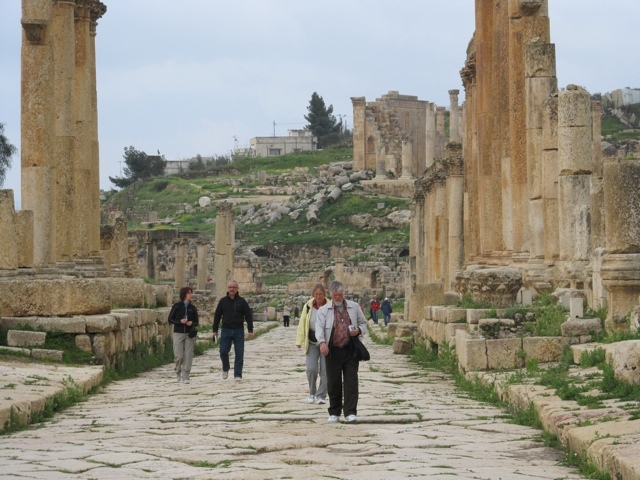 We drove about 40 mins to Jerash, a Greco-Roman site to the north, but lower in elevation than Amman. Amman is about 2000 ft. above sea level, and rather cool right now. 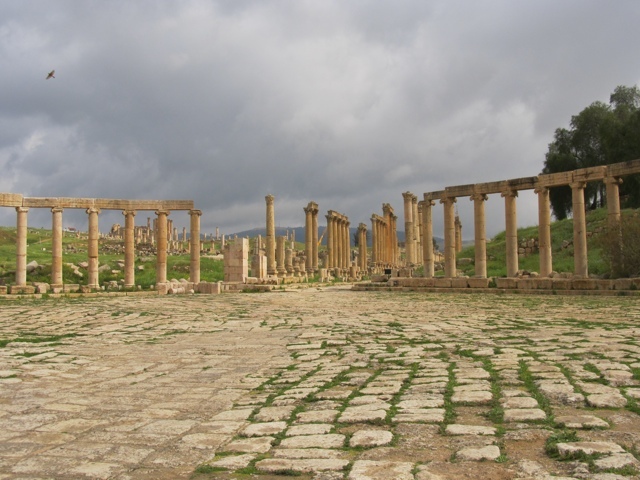 Jerash is in a valley, where the Greeks tried to construct a typical flat orderly city in between hills. The Romans came along and increased the size, changed the focus of the temples from the “old” greek gods to the newer, shinier Roman gods and built a hippodrome on land fill, which apparently fell off the side of the hill rather quickly. 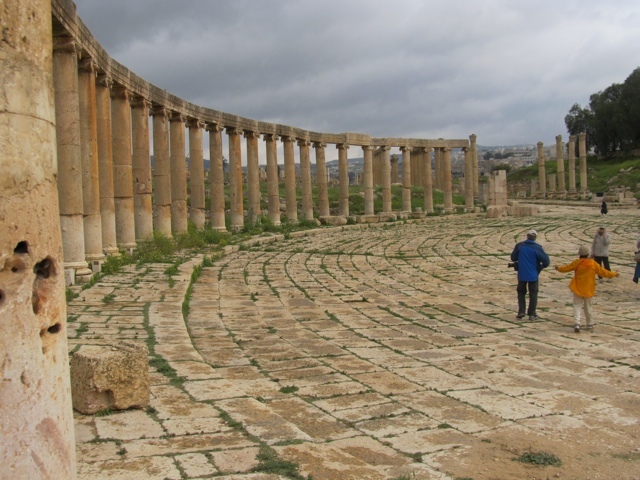 It has a lovely oval shaped agora, or gathering place, paved in limestone as is the whole city. There is a colonnaded long street, or cardo , with temples, a public well and the ruins of what were small shops. The street boasted an underground sewer complete with man-holes! all stone of course. 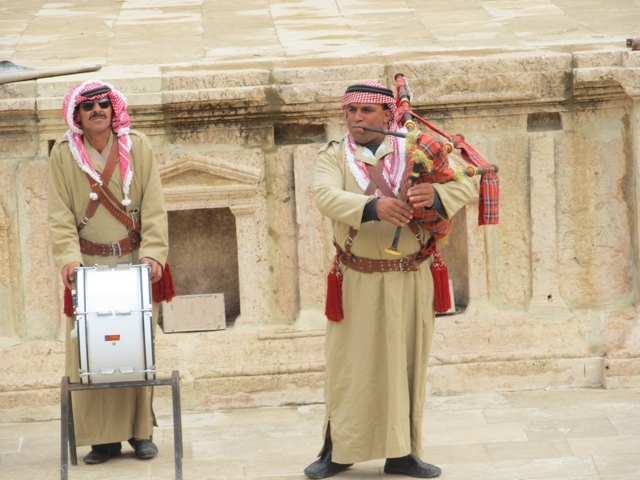 In the large theater, there was a local two man band- an upright drum and bagpipes, presumably remnants of the British presence here. It was the birthday of a women in our group, and the plan was to sing Happy Birthday to her in the theater, with the band. As so often happens, plans change. 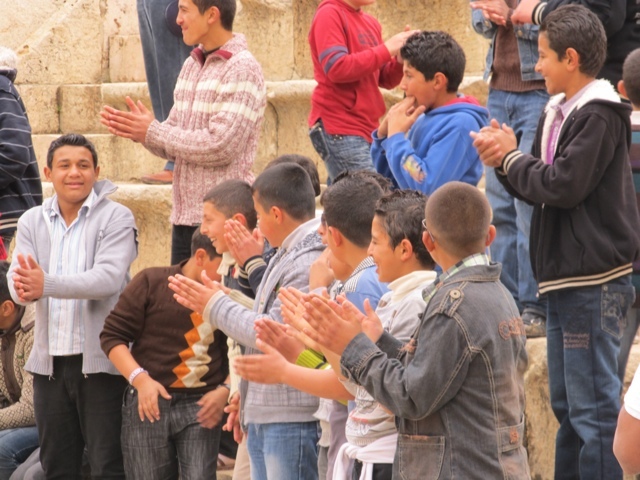 A group of school boys followed us into the theater,noisily jumping and running around on the steep stone seating platforms. Samihr talked to them, and they quieted down. Then the band played Scottish tunes and motioned for our member to come down and join them. I still thought they’d play the birthday song and we’d all sing along, but no. I guess it’s not in their repertoire! 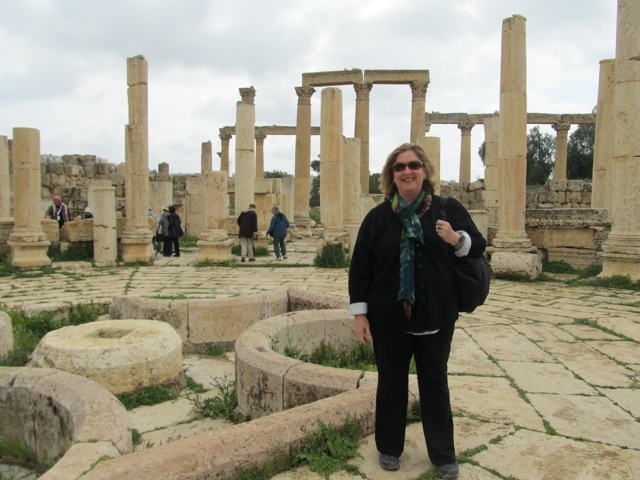 We had fun anyway, and continued to see all the sights of Jerash. It was a cool, grey morning with occasional sunny moments, and I forgot how tired I was. Michelle and I continued to take photos of each other in various spots around the site, and we enjoyed the lovely weather. There was a fascinating place where, some years after the Romans left, the then current occupants tried a very advanced system to re-use the columns littering the site. They constructed a water-powered stone cutting device, using parallel metal saw blades that cut three or four slices at one time through a limestone column. The slices were used as paving stones. But, apparently the blades didn’t last long, the whole thing was abandoned not long after the invention. Evidence of it was clear enough that recently, someone re-built it – not a working replica but it looks great! By the time we were walking back to our bus, it had suddenly darkened and started to rain. It was lunch time and we enjoyed another really delicious meal, featuring a mixed grill of chunks of grilled lamb, ground seasoned lamb formed into sausages and grilled and really tender flavorful white meat of chicken that had been marinated in yogurt and spices, then grilled. And great babaganoush! We all ate too much, but it was so good! Our next stop, and where I had planned to make my exit, was a visit to the American Center for Oriental Research, or ACOR. 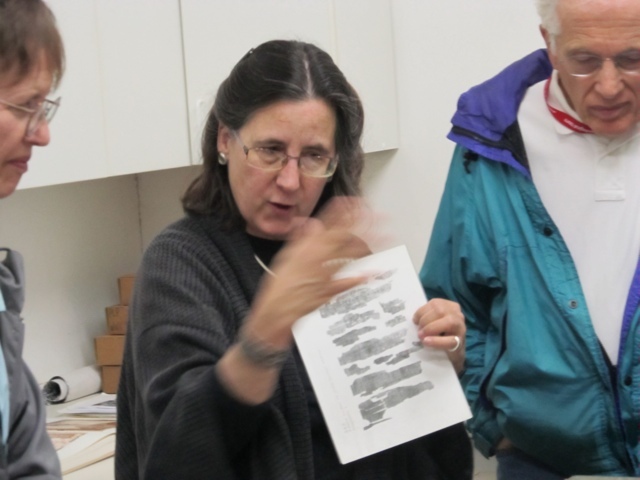 It is an organization dedicated to assisting in the work of archaeology, anthropology and other efforts to link the US with the Middle east through scholarly work.Among other things, they sponsored the analysis of papyrus scrolls found 14 years ago in Petra, but burned and then buried after an earthquake. The results were described as looking like black cigars! One of the local workers hired to dig out the site for archaeologists convinced that there was nothing in the place, noticed that he could see some writing, even on the blackened material. This observant worker set off 14 years of painstaking analysis. 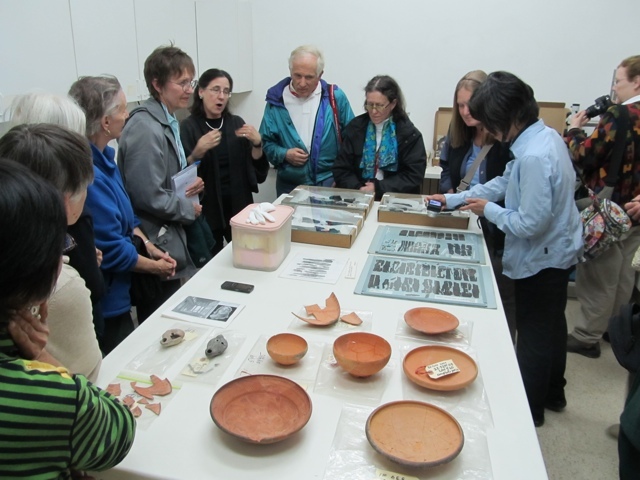 We were lucky to be able to meet two of the Finnish archaeologists who have been working on the material for all these years, and we got to see some of it! Black irregular bits of charred paper at first glance, but a more careful look revealed darker black ink on the grayed paper. Not an easy task to pour over this for years and years! I really admire the folks who do this in order to reveal to us aspects of life 2000 years ago. Back to the hotel. Tomorrow I’m breaking free of the tour and going off in search of art. More later, and photos. I forgot to download them before coming to the lobby to use the (paid) internet connection. After breakfast, Joe Greene, our lecturer on Archaeology and related topics, gave an overview of our time in Syria – what we saw, how it fit together. I must admit that archaeology was not my motivation for going on this trip, but thanks to Joe, I have a much greater appreciation of why the discipline is relevant to contemporary life. In different ways, most if not all, human beings, search for some sense of meaning in their lives. Where we come from is one source of meaning and archaeology can help to identify, to pin-point, the ancient past. Pulling from sources as divergent as the Torah, the Christian Bible ( New Testament), Homer and other Greeks, actual locations of events written about thousands of years ago are continually being identified all across the Middle East and Mediterranean Europe. What were once considered myths are sometimes turning out to be more or less accurate descriptions of real events that took place in the ancient world. Seeing locations where battles were fought along the Euphrates River 2500 years ago over control of the same territory that is being fought over today, is humbling. Later, on the bus, Walid asked us how our impressions of Syria had changed by our time in his country. Most felt more positive towards Syrians, if not the government. I spoke up, after listening to a few others. I felt that it was important to understand that Syria, like other countries in the midst of cultural change, in the end, cannot resist change. The more the government tries to hold on to the status quo, the resistance to the demand for change becomes stronger. There is a quote from Norman Mailer, of all people, that I keep taped to my telephone at home. It says, more or less – that change is law of nature, and that holding out against change takes its toll, in many ways. We continued on to the town of Bosra, not far from Deraa, where there has been a great deal of protest. All the roads leading into Deraa from the main highway were blocked by security forces. It was not a pleasant sight. In Bosra we toured a Roman -era theater built of the local black basalt stone, which lent it a more sober, almost ominous air. But the stage area had gorgeous columns and pediments of pale limestone, which in contrast with the black stone made for a setting of high drama, even before the actors appeared on the stage! We left the theater and walked through the old, really old, part of Bosra where residents have used the existing ruins of the same black stone to create homes for themselves. There were also remains of other structures such as wells and city gates. It was the end of the school day for the young kids, and they were filtering home through the ruins as we walked along. Some volunteered “Hello”, some were shy. Some liked having their photo taken, some said “NO!”. Walid suspected it was linked in some way to the Deraa violence and over hearing their parents talking about fear of security people taking photos of protestors. Or maybe just shyness. I loved walking along through the jumble of buildings, taking photos of doors,windows, white-washed stones, people. We have had so little time to explore and interact with people on this trip, I missed that and took the opportunity to lag behind the group and explore on my own. Eventually I caught up with the others and joined them for a nice lunch in a rather lovely hotel on the outskirts of the town, the sort of place where local girls might dream of holding their wedding. After lunch we headed for a border crossing into Jordan. Lots of waiting on the Syria side as the officials reviewed our visas, looked at us all, looked at the passports again, and made us wait, again. 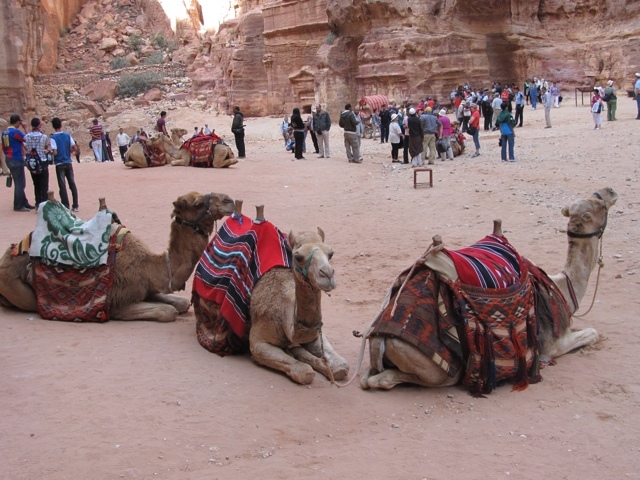 Then onto Jordan, where we had to all purchase our visas individually, then get them stamped, then get back on the bus. As we left Syria, a scowling young man got on the bus and examined each of our passports one last time. 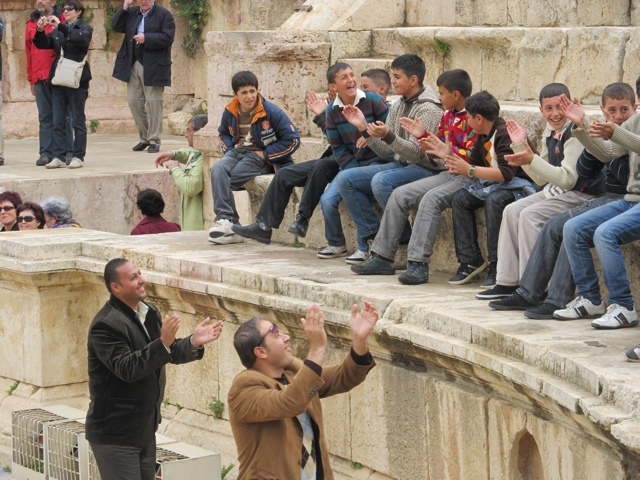 In Jordan, a young man joked and laughed with us as he checked our passports and visas. The process was the same, but the attitude was very different. Crossing the border took about 2 hours all told, mostly waiting. But we saw lines of trucks trying to cross from Syria into Jordan that must have been there for days! Apparently Jordan searches them carefully looking for arms and other contraband being smuggled in from Iran through Syria. On the Syria -Iraq side of the country, the border is rather “porous” was what I heard. We reached our hotel in Amman at 7pm, exhausted by the long hours on the bus as much as anything we actually did. Our hotel, while not the fanciest in Amman, is head and shoulders above the Damascus Sheraton, our fanciest hotel in Syria. Jordan just feels different, lighter, brighter, less worried. More later. I still can’t get into my regular email, karen@sfslater.com. So, if you want to contact me use – abtcksf1@yahoo.com,my alternate email address. Our trip has been fantastic so far, and yesterday, due to “unrest” in Latakia, we stayed in Tartous, in a brand new hotel, part of a planned family holiday complex on the Mediterranean, right next to a big shipping harbor. After a day of climbing around a crusader fort , Krak des Chevaliers, it felt wonderful to collapse into a king size bed with breezes from the sea coming through my open balcony windows. I’m writing a longer post for the blog and hope to download it in the next day or so. The internet situation is just odd and I can’t count on doing what I managed to work out last week. Still, being here is exciting and wonderful. The history of this part of the world is still important today as the geopolitical forces are re-arranging themselves. Being right here does not make it easier to know what is happening here. \not understanding arabic, we rely on the BBC,CNN and, when we can get it, Al Jazeera english for news. But, our tour manager Alice and local guide, Walid, are talking all the time to other tour groups and drivers when we stop for lunch or bathrooms. and walid talks to other people he knows. We are well taken care of, and safety is clearly their major concern, if not so much mine. My ideal would be to become a fly on the wall , near exciting events but safe from potential harm. not everyone else else on the trip feels this way. one woman said that they would have cancelled if they could have gotten their money back. to me, it’s just that much more valuable an experience. Tomorrow it’s up at 6:30.on the bus at 8 and off to the “dead cities” region in the north of Syria.